This statement basically sums up the reason I signed up for the marathon. The new routes, timing chips, donate a shoe program, potential new PR, and even the medal were not enough to entice me to join—only the 42K finisher’s shirt. On the other hand I had many reasons why I wasn’t jumping for excitement to join the race: my right knee still hasn’t reverted to “normal” level, I wasn’t prepared, my final exam was on the eve of the marathon, etc. just to name a few. It was only through a “Divine intervention” that my fate was sealed—registered a day before the deadline of the extended registration period. 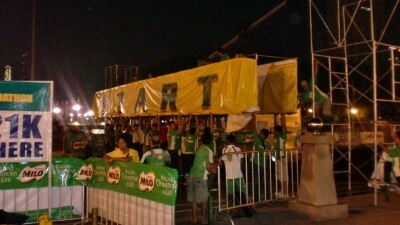 After an “interesting” commute I arrived at Quirino Grandstand at around 3AM, an hour before the marathon gun start. Last year I arrived 30 minutes early but ended up 10 minutes late, and I didn’t want a déjà vu. 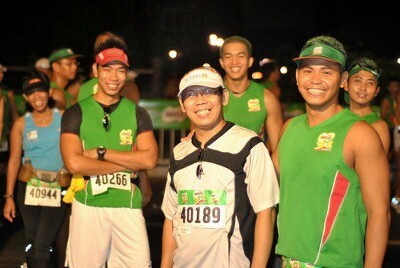 This race served as a mini reunion for me with my takbo.ph family. I thought that I’d be running like I was during my first MILO® race (alone) but surely enough, the gang was there, although I was surprised that Vener (run unltd. 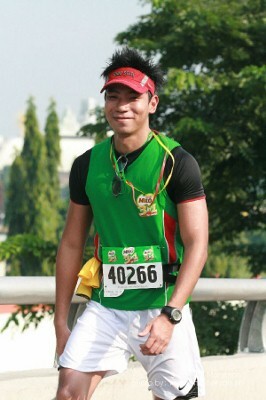 ), a two-time MILO® Marathon qualifier, didn’t join this year. With my finish time out in public I think I’m going to raise some eyebrows when I say that I intentionally capped my speed to around 9kph (kilometers per hour) or 06:40/km pace, and aimed just to finish within 6 hours (the curfew). With a “not-so-normal” knee and with just a single 10K run (on trails with an ultramarathon pace!) I had to play safe as I have every intention of finishing this race! (Marathons never get shorter or easier no matter how many times you do it!) “Crawl if you must” as my friend Jet described his marathon experience. 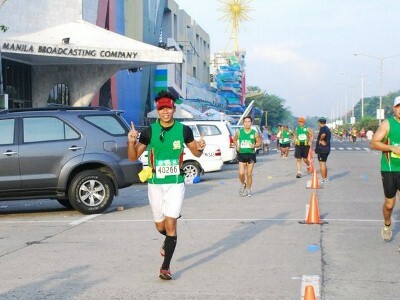 The marathon leg started at 4:09AM (Garmin), nine minutes off which is atypical by Mr. Rudy Biscocho’s standard. The new “timeslot” is beneficial with our climate as runners get to enjoy less of the sun, even just for 30 minutes! 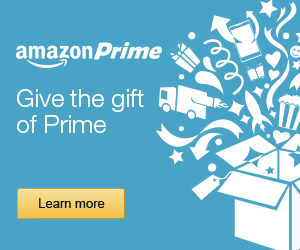 If you ask me I would even prefer it to start around midnight! 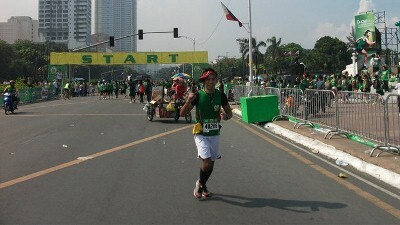 I started the race with Rico, a fellow ultramarathoner, as the rest of the gang sped away into the horizon. It was like the good old ultramarathon times when we just chat away the kilometers, except we were faster (conscious monitoring via GF405). Occasionally we exceed my cap of 9kph (which I never mentioned to anyone until this post) but I didn’t mind as long as I didn’t feel any pains. 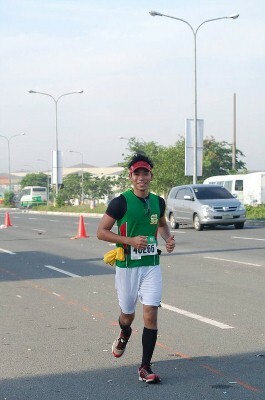 Everything was smooth-sailing until the sun slowly greeted the runners with his warmth. I think some of us were solar-powered as I noticed the improving pace of the runners in our vicinity. I’m stuck on first gear so eventually I had to let my buddy go ahead with his race. I don’t have a schedule to keep, just a pace to maintain, so cruise control it was! First loop complete, two more! MILO® really exhausted my tolerance on loops by having not just two but three loops of 10K length. At my “cruising” speed of 9kph it would take me an hour and a half to complete one—it’s like watching a boring movie three times in a row. The things I’m willing to do for that shirt! 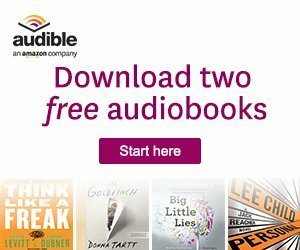 Third loop, this is it! To my surprise one by one I’m overtaking some buddies who were way ahead of me. It hurts me to overtake anyone as I publicized that my target was just to do a “walkathon” of 6 hours. As much as I’d love to stay and chat my “cruise control” was still intact so I had to overtake, sorry about that. Approaching Aliw Theater for the third time I felt my body warning me of an imminent cramp—both on my quads and hamstrings! Luckily I was approaching takbo.ph’s support station so I asked for anything that could help. As I approached I saw a runner that fainted, but he was already being tended to. As much as I would like to stop and help I’d just be a nuisance since I wouldn’t know what to do anyway, so I just went on and got some of that liniment spray which effectively stopped the onset of cramps—or so I thought. Just a few hundred meters later my hamstrings were really giving me some serious symptoms. Fortunately the liniment wasn’t absorbed totally yet so I had to reapply it all over without stopping (I felt that if I stopped I’d get stuck!). That time it worked but I had to tune down my cruising speed to 8kph with short walk breaks. The walkathon had begun! By the time I was running for that 42K turnaround point I was really hating those two flyovers—for the sixth and seventh time before turning back for more which made the 42K route having a total of 10 flyover crossings, a PR? Now who says that the route was flat? Homestretch, around 5K to the Finish—no more water! 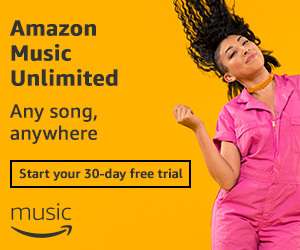 My worst nightmare has come. It’s my first marathon all over again. With an empty hydration belt on my waist and no water station in sight I was forced to walk. This time around some of those I overtook earlier caught up with me, and even if I wanted to join them I simply cannot without water (call me Agua :)). Cultural Center of the Philippines—an oasis as far as MILO® Marathon is concerned where one of the last standing hydration station serving sports drinks remains. I wanted to refill my hydration belt then but they’re down to their last few cups so I just restocked with the contents of a cup (just a few sips worth). A little more than 3K to go! Walk-run combo was the theme for many runners during that last 3K. Anyone who has run Roxas Blvd. would know how hot it can be, even as early as 8:30AM. If you don’t have support it’s better to play safe. 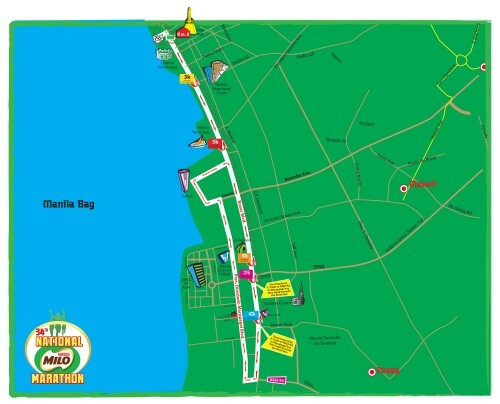 Finally I can see the Start line, down to the last few hundred meters! I wanted to run but I was so dehydrated that I can only manage short bursts. And on that final curve to the Finish I saw Rodel (The Argonaut) who overtook me a while back. As I approached him from the back I challenged him to run and unexpectedly he took the challenge! And so, crazy as we were, we had a sprint showdown to the Finish, both of us on the verge of having cramps! I jokingly said to him “unahan na lang mag-cramps” (it’s just a matter of who gets a cramp first) as we sprinted towards the finish line, no one willing to be the runner-up. Like with my BDM102 power tripping, I won’t just hand over that ranking without a fight :). Isn’t it better to feel you have earned the spot rather than been given to you? After crossing that shoot my finisher’s medal and certificate was awarded along with a loot bag and that most anticipated finisher’s shirt! It’s a shirt that isn’t even branded but is worth that 42.2K trip. 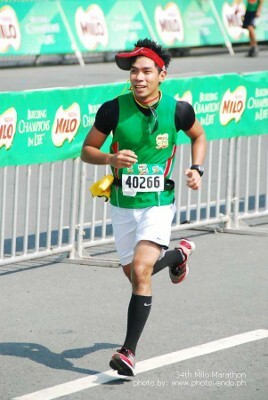 Completing that MILO® Marathon experience was that ice cold MILO® drink that I missed last year. Marathons are always enlightening—how anyone handled their race tells a lot on how they live their lives. To the enlightened ones, congratulations!